Cleaning the bathroom can often be a tough job, but like a lot of chores around the house, it’s something that simply has to be done. The bathroom can be a messy area, and everyone in your household is bound to use it daily, so here are a few tips you can take on board to stop feeling like you’re always cleaning up after everyone. First of all, inform everyone it’s time for a few new house rules. First of all, remind everyone to “use it and put it back”. In most houses, the bathroom is relatively small, which makes it easier to clutter up in a short space of time. Although you may have got used to this state of affairs, everything in your home should have a designated home, and when you’re done with anything you’re using in the bathroom, that’s where it needs to go. If you have young kids or even teenagers this may be a hard point to hammer in, but be persistent and soon enough they’ll appreciate that it only takes a few seconds to put the toothpaste back in the cup, the hairdryer in the cupboard and the makeup back in its box. You might slip up here and there when you’re in a rush to leave, but carry on setting an example and the rest of your clean will eventually follow. The next pointer would be to take an inventory of all the cleaning products you have in your bathroom, and stock up on any that you’re missing. Your bathroom cleaning arsenal should include microfiber cloths, which you may want to colour code for different jobs, an old toothbrush for cleaning narrow, hard-to-access areas, a spray-bottle of window cleaner, multi-surface cleaner, and a vacuum or broom. 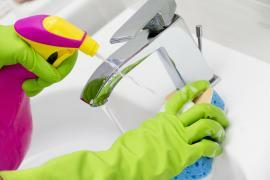 Make sure to be methodical when cleaning your bathroom. Start in one little corner, then work around clockwise or anti-clockwise if you prefer. This way you can rule out forgetting what you have and haven’t cleaned, and putting in more work than is necessary. You can also plan ahead, spotting areas that need soaking, which you can leave while you work on cleaning parts that don’t need it. When you set to work, start off with tidying the room up. Your new rule probably hasn’t come into full effect yet, so find anything that isn’t where it should be and put it away, empty the rubbish bin and pick up any laundry that’s been left lying around. Once you’ve cleared some space spray the outside bowl of the toilet, and the interior of the sink and bath with a good all-purpose cleaner. After this, find your microfiber cloth, get it damp, and go over all the walls, frames, and fixtures. For any areas that are hard to reach at this stage, wrap it around the end of a long utensil. Use glass cleaner on any mirrors you have, and all-purpose on counter tops that have been stained. You will have already sprayed the toilet with a cleaning agent, so when you get back to it use a paper towel or yet another microfiber cloth to wipe down the outer tank, bowl, handle seat, and the top and undersides of the rim. The old toothbrush may come in handy here for getting at particularly built-up dirt. Similarly, when you come back around to the shower and bath, you’ll have done half the job already. You shouldn’t need to scrub it anymore, and will be able to simply rinse whatever’s on the walls away. Finally, spray the sink with an all-purpose cleaner, wipe it down, then have a look at all your hard work and go reward yourself with something!